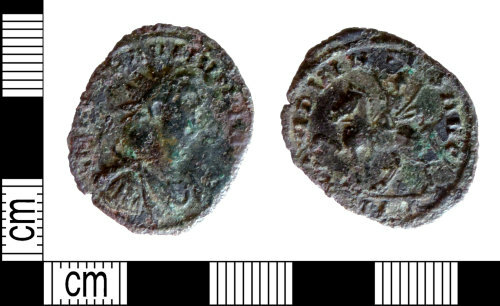 A complete copper alloy Roman radiate of Carausius (A.D. 286-293), dating to the period 286-293 (Reece Period 14). ADVENTVS AVG reverse type, depicting emperor riding left, right hand raised, left holding sceptre. Uncertain mint. RIC Vol.V part ii, p.514, no.598. Obverse description: Radiate bust of emperor, right, cuirassed and draped. Reverse description: Emperor on horseback, riding left, right arm raised, sceptre in left hand.